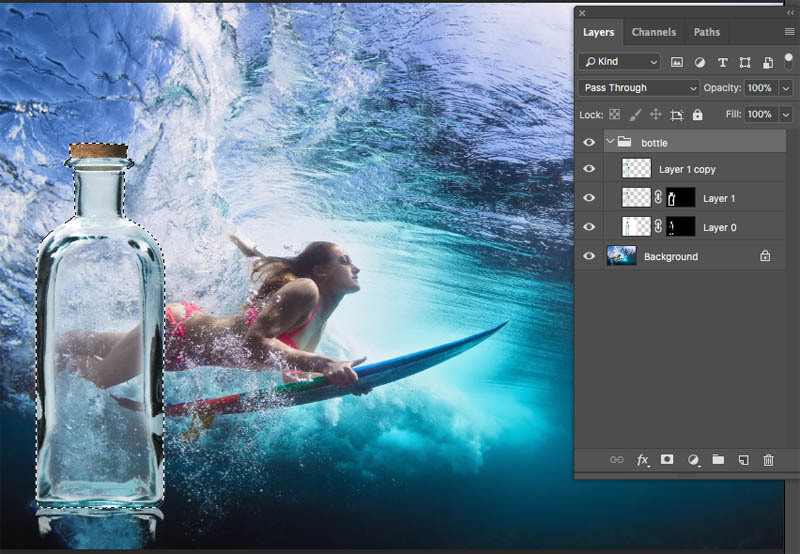 How to cut out glass, smoke and liquids in Photoshop. 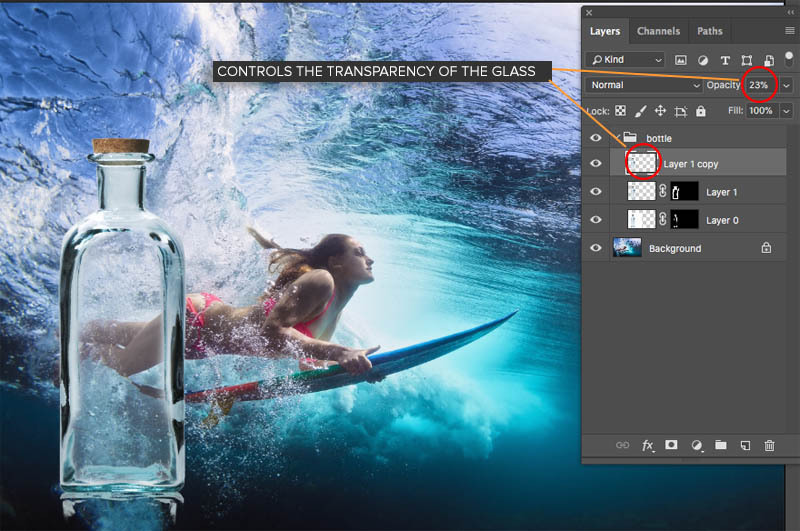 Colin Smith shows you how to select semi transparent objects in Photoshop and mask them for seamless compositing. Hi CAFE Crew! I think you are really going to enjoy this week’s tutorial. I’ve been working very hard on this because I know that it’s going to be a favorite. 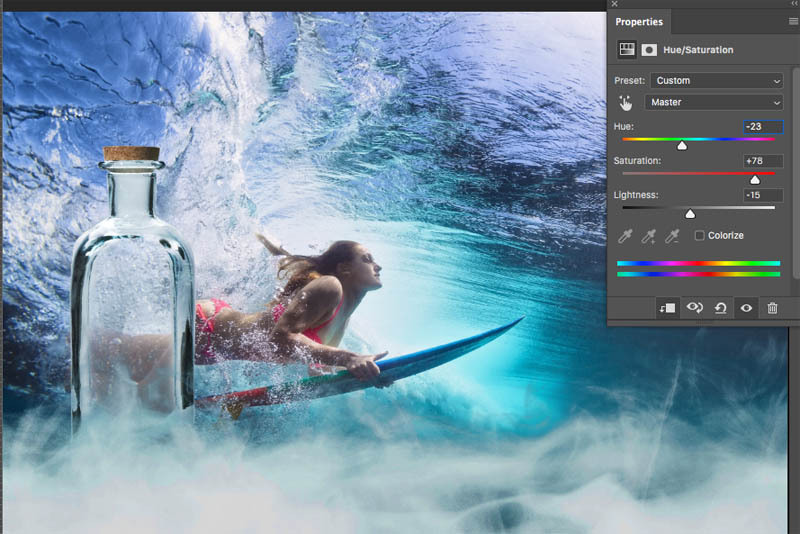 So many people don’t know where to start when it comes to cutting out transparent and semi transparent objects in Photoshop such as glass, smoke, water etc. 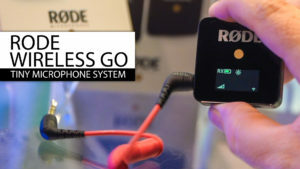 This method that I’m about to tech you is what I have been using for years in my commercial work and with a little patience, I hope this workflow will serve you as well as it has me. For this tutorial, rather than use my own photos, I decided to grab a couple of images from Adobe stock: This way you can grab them yourself and follow along. Before I begin, let me proactively address a question I’ll get. 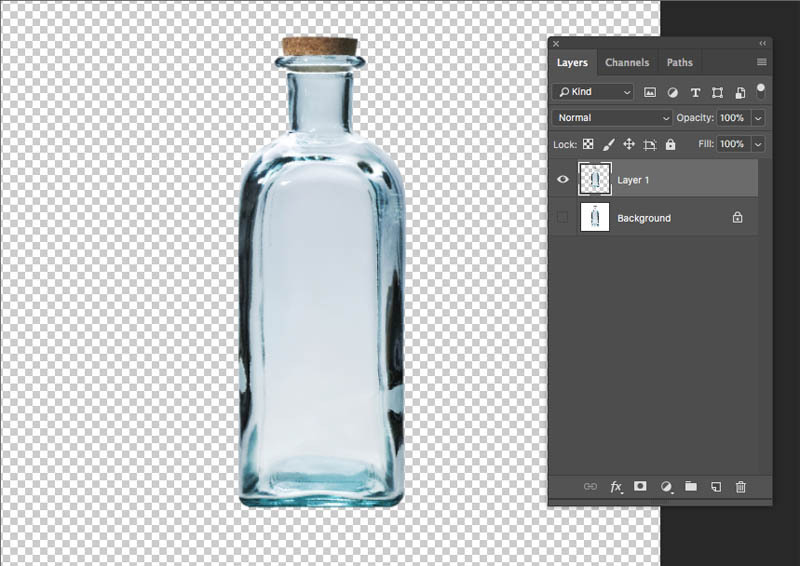 “This glass is against a solid color, its easy compared to a complex background.” #1 I’m using Stock, why would you use a stock photo that has a complex background, choose a different photo. #2 if you are photographing it yourself. 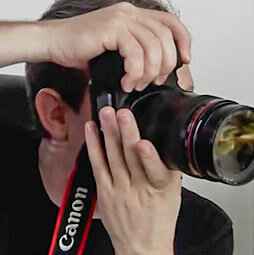 Why are you photographing objects with a busy background? Its so easy to set up a piece of seamless paper or even hold a sheet behind it. 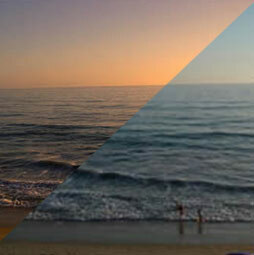 If you have a complex background, it’s better t reshoot or use a different image. However, if you are forced to use a complex image, I have a different tutorial for that here. Let’s begin by cutting out the glass bottle. This technique is going to give you a crazy amount of control and make the glass see through, you can control how see through it will be! The first thing, is to use the quick selection tool. Drag it over the white area to make a selection. 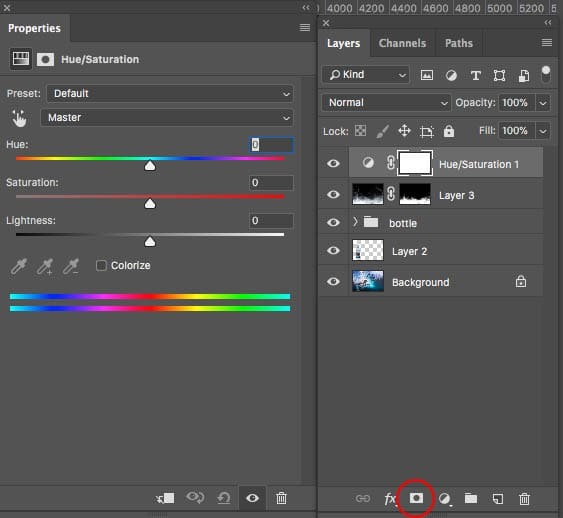 If you go too far, you can exclude areas of the selection by alt/option and clicking with the tool. Here we need to clean it up a little bit on the edges. 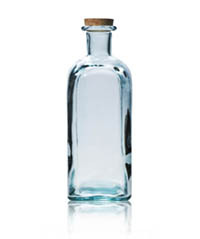 We have now cut out the bottle shape, but not the transparency yet. Let’s cut out the transparency, shall we? 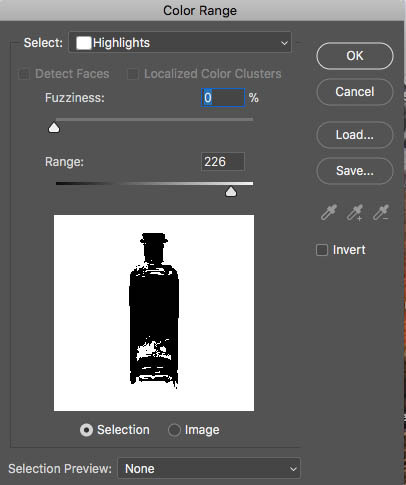 Click ok, and you will see marching ants on the bottle. Any areas that are less than 50% transparent won’t show marching ants, but will still be selected. 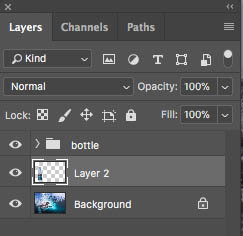 Make sure that the background is the active layer as shown here. Click on the Mask button to mask out the transparency. (If yours look the opposite, undo, hold down Alt/Option as you click the mask button). We are missing some key parts to the bottle, let’s fix that now. Hide the top layer. 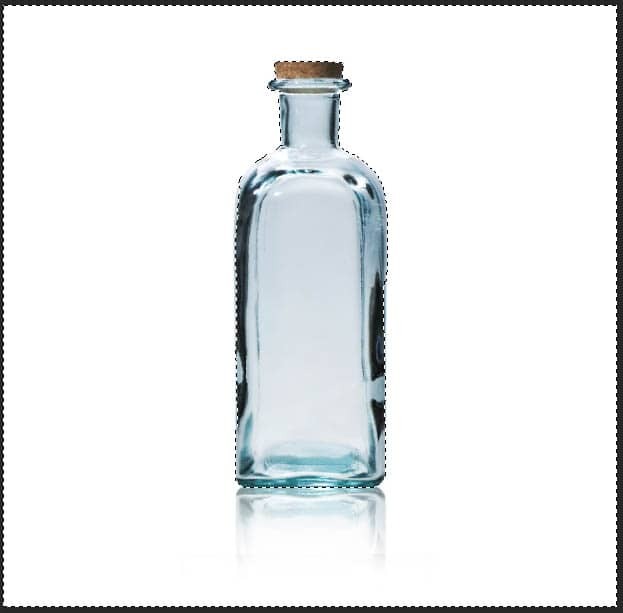 You should now see the bottle as opaque again. 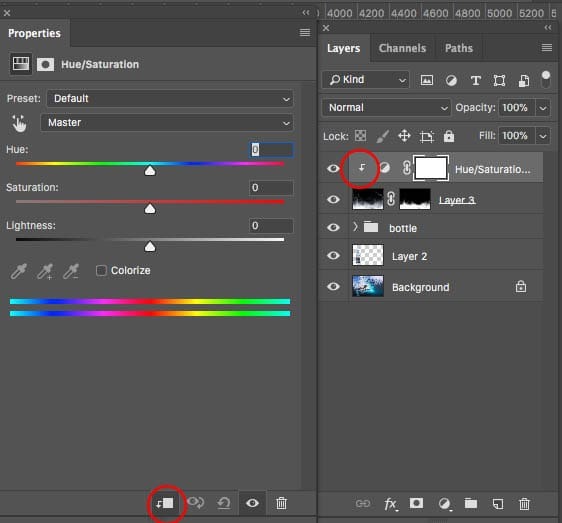 Create a hidden mask, but Alt/Option clicking on the layer mask button. 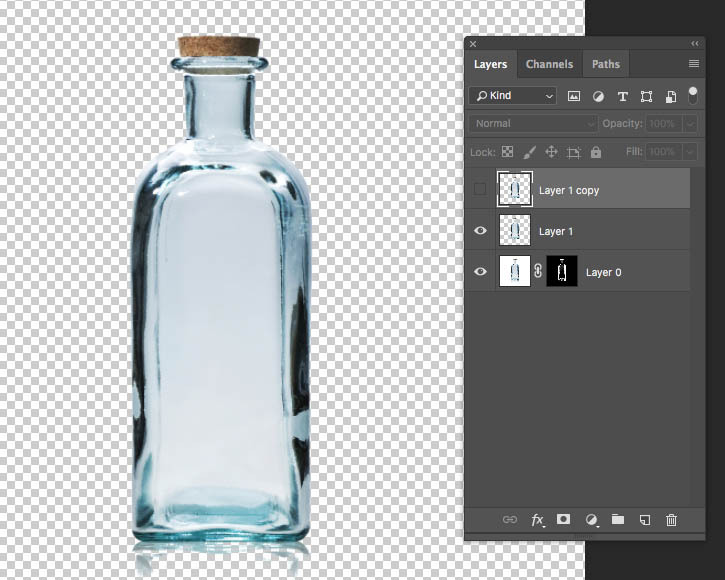 With the layer mask selected on the middle layer, paint around the edges of the bottle to make the important areas fully visible. Now we have a really cool setup. 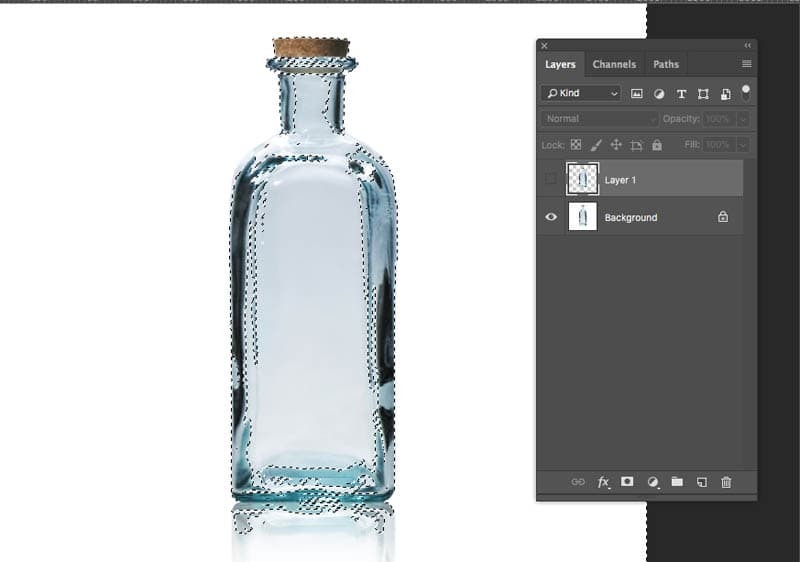 Turn on the top layer and adjust the opacity to control the transparency of the bottle. Pretty neat huh? 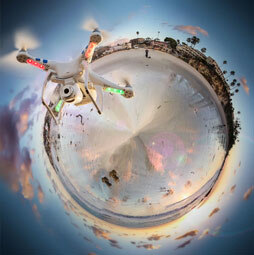 Let’s composite it into another photo, while keeping the setup so we can change our glass transparency. Before we move it into another photo, let’s box everything up, just like you would with your stuff if you were moving house. 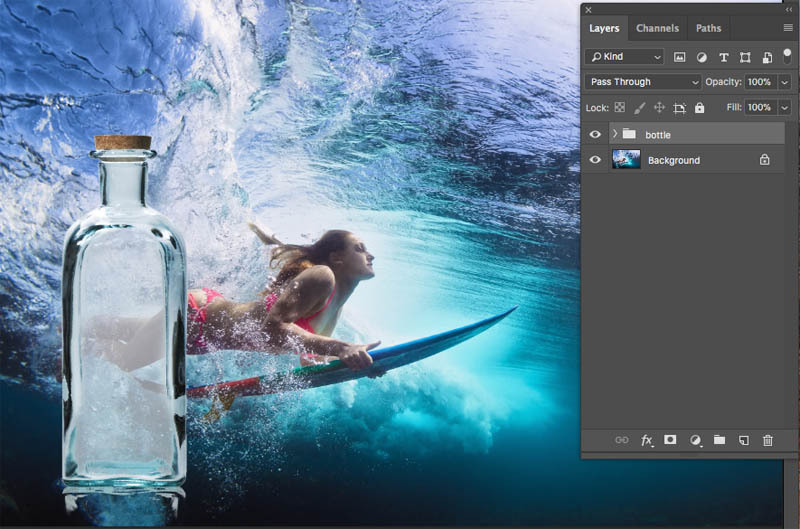 Make sure your destination photo is open in Photoshop. (The surfer girl). 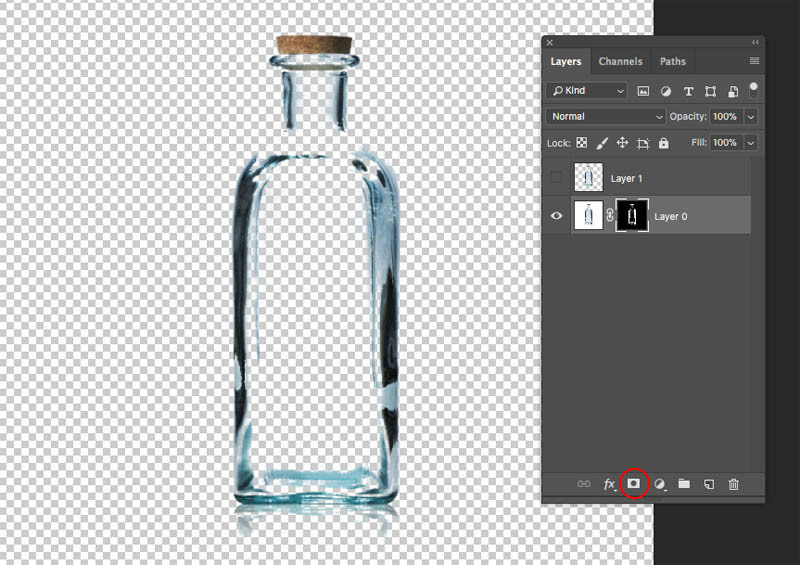 With the move tool (V) drag your bottle into the tab at the top for the new image (Don’t release yet) wait for the image to open and then move your pointer into the middle of the new document. 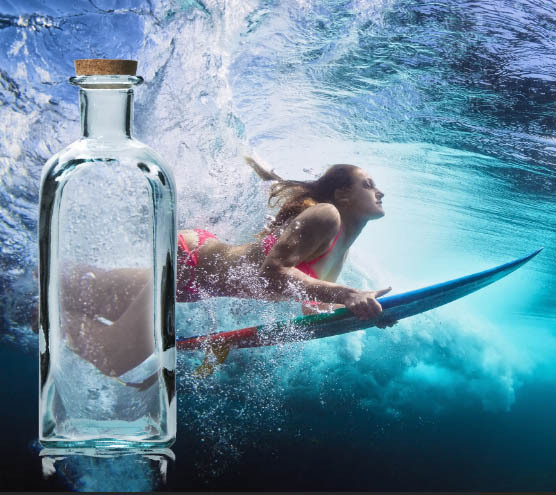 Release, and your bottle group has been added to the surfer photo. 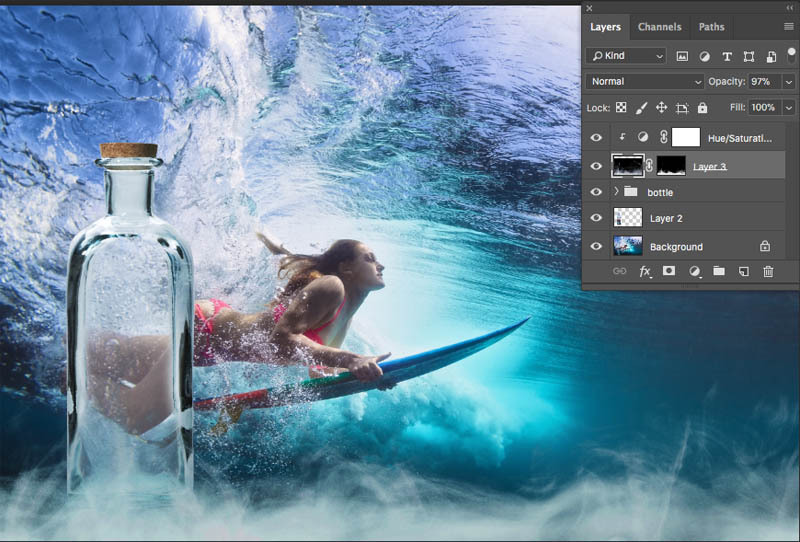 How to combine images in Photoshop made easy. 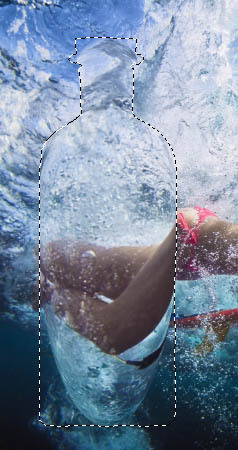 If you expand the bottle group, you will see that you can still adjust the transparency. This is important, because you can see it better on a background and probably want to reduce the transparency a little bit. 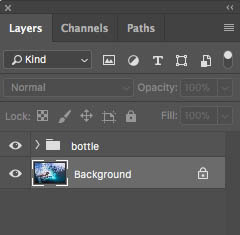 Hold Ctrl/Cmd and click on the layer thumbnail of the bottle (top layer) this loads the selection for the bottle. 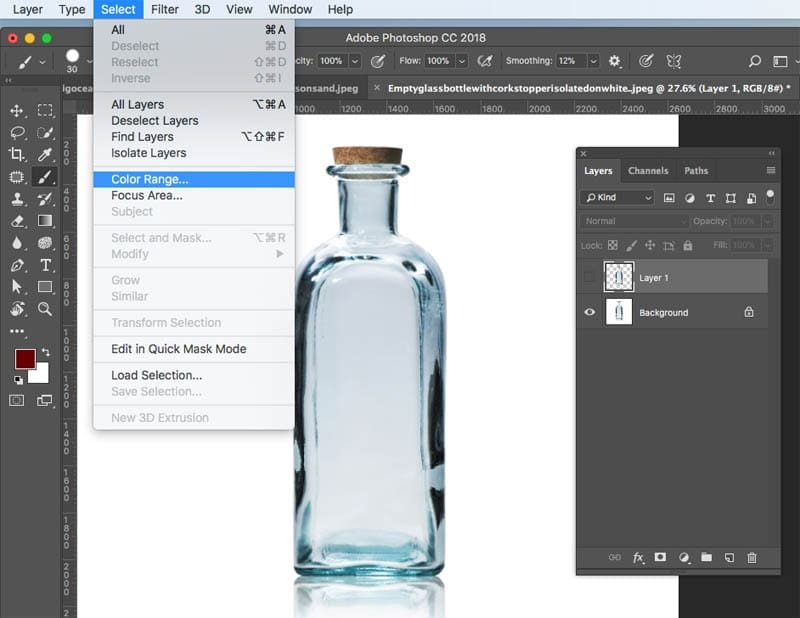 Press Cmd/Ctrl+J to copy a selection of the background to a new layer. 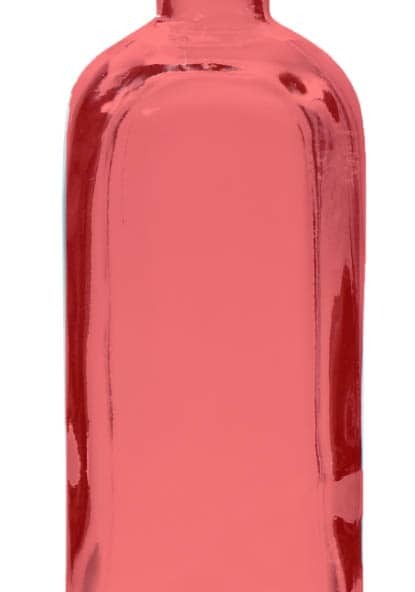 Here is the selected layer in the shape of the bottle. Let’s distort it! Ctrl/Cmd+D to turn off the selection. Turn our bottle layers back on and lookie! We have glass refraction. Cool! 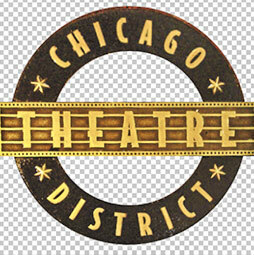 Now we are going to cut out smoke and do a little tweaking for a cool effect. 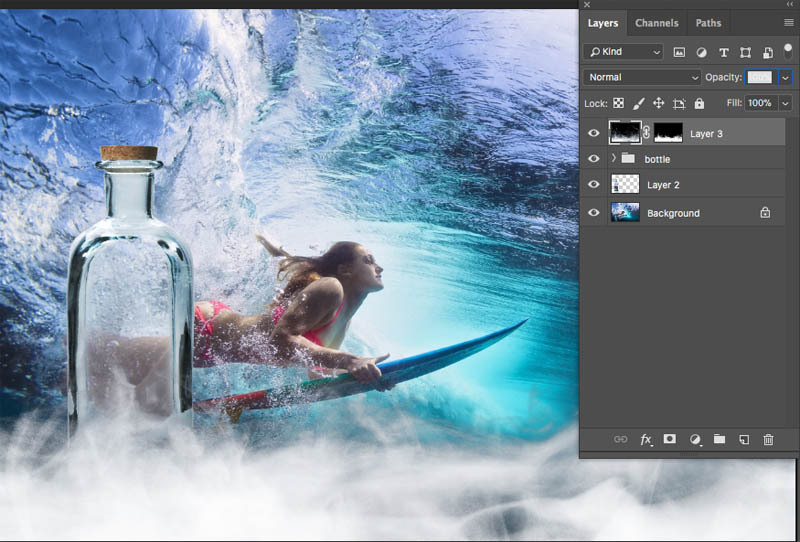 I’m really doing this so you can see how to cut out vapors in Photoshop as well as a cool creative idea. Grab highlights again and use the settings shown here. 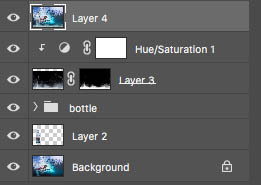 Make sure you choose the layer and not the mask in the layers panel. 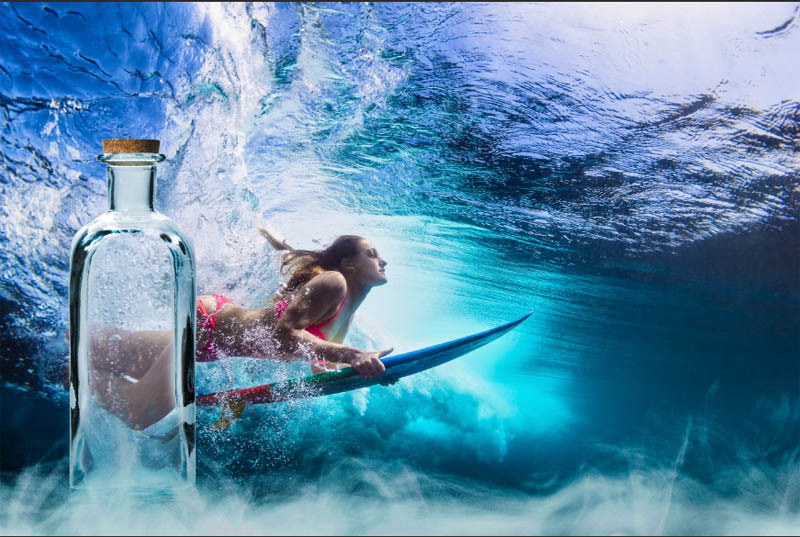 Drag it into our composite image exactly the same way we did with the bottle. Position and size the smoke to suit your tastes. 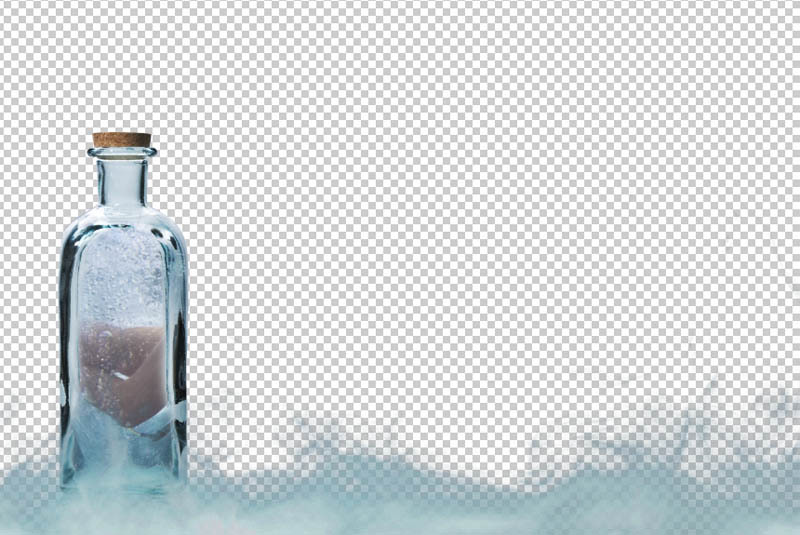 Make some adjustments to add an aqua hue to the smoke. Notice that lowering the Lightness slightly allows us to add color to white. 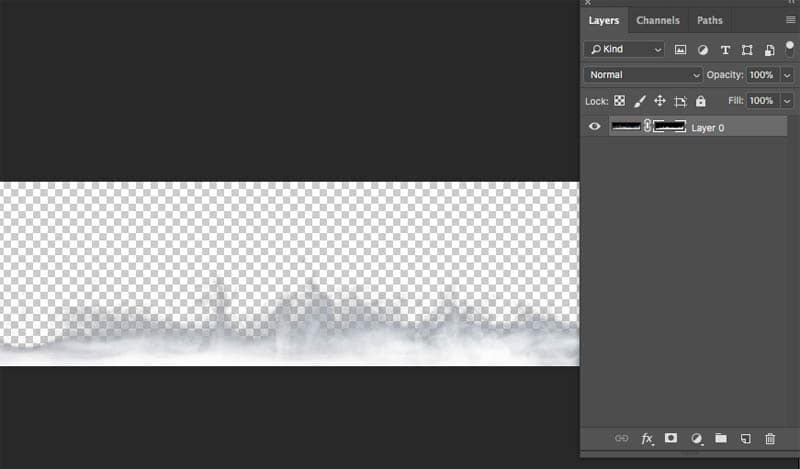 Here is the image and the layers panel visible after the adjustments. 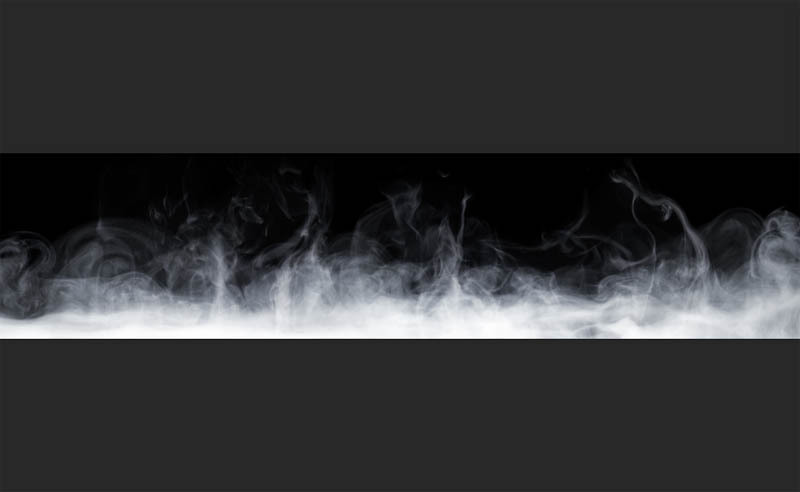 Adjust the Opacity of the smoke to blend it in nicely. If I hide the background you can see the work we have done on the transparency. Didi you think you would be doing this in Photoshop? It’s fun! 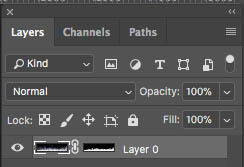 Let’s make a layer on top that contains all the layers combined. Select all the layers and Press Ctrl+Alt+Shift+E (Cmd+Option+Shift+E Mac). You can see the adjustments I made to the color and tone, to give a little more pop to the image. And here is the final. 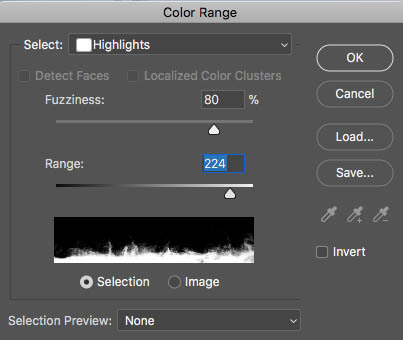 Some may ask why I used this method rather than using blending modes. The result is a little different with the modes, Using Screen actually works quite well for the smoke, but we lose a lot of the color in glass if we do it that way. 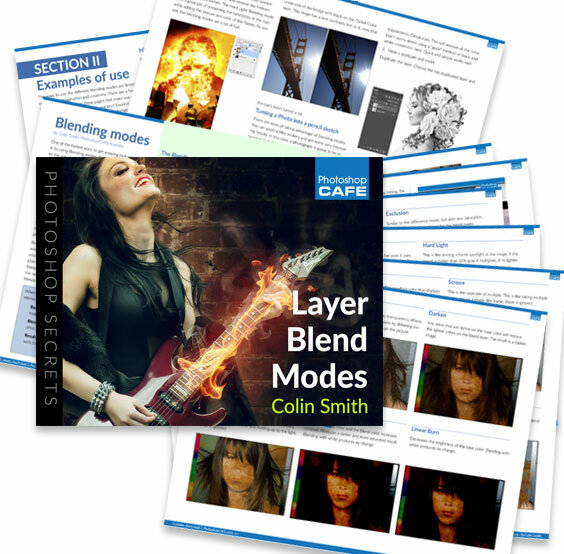 I do have a really good tutorial on Blending modes too, check it out here. Don’t forget to join our mailing list for free goodies and also be informed of free tutorials that I release each week. Great to see you here at the CAFE and I look forward to “seeing” you again on my next tutorial. 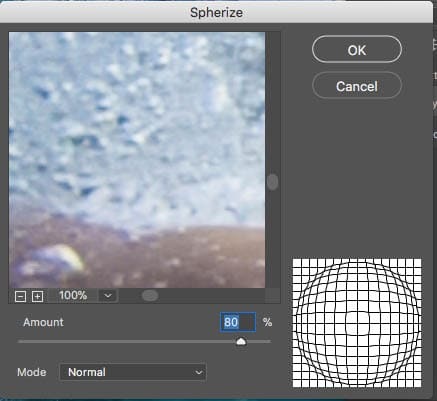 Like everything else in Photoshop, there’s multiple ways to skin the cat – this being one that seems pretty simple to me – and I love ‘simple’ when it comes to Photoshop. 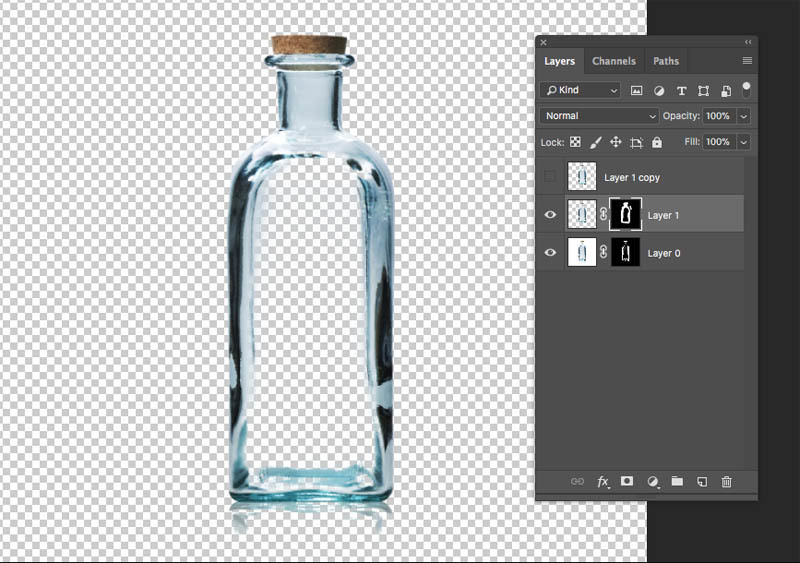 Dupe the background layer and name it the ‘Bottle-only’ layer. With the Bottle-only layer active. 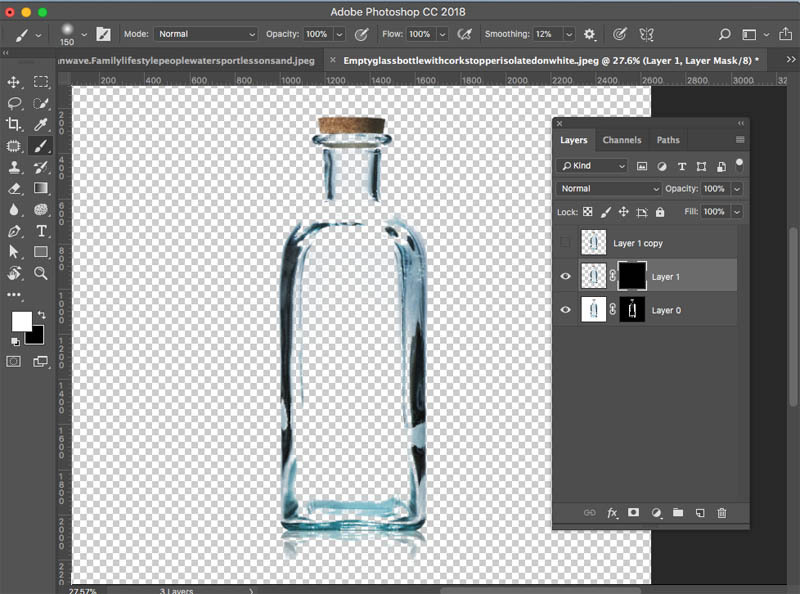 Select the bottle from the background using the usual tools (quick selection tool, refine edge and edit mask mode or whatever you prefer) and save it as the ‘Bottle’ selection (I always save selections in case I want to go back to them). Select / Inverseand save it as the ‘Background’ selection. 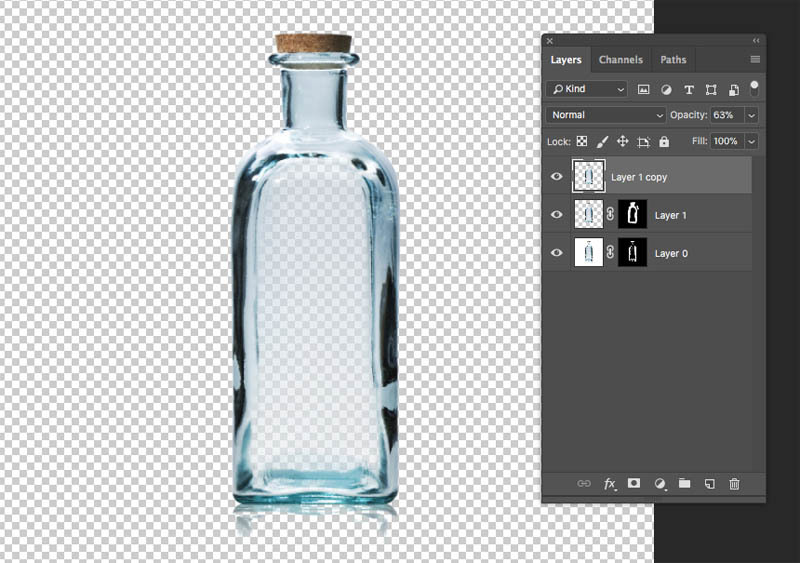 With the Background selection active: Edit / Clearso the bottle is now on a transparent background. 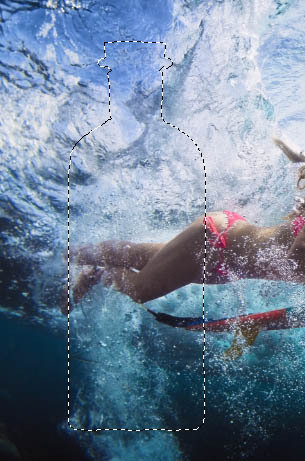 Select the inside section of the bottle using your preferred selection tools and save it as the ‘Inside Bottle’ selection. 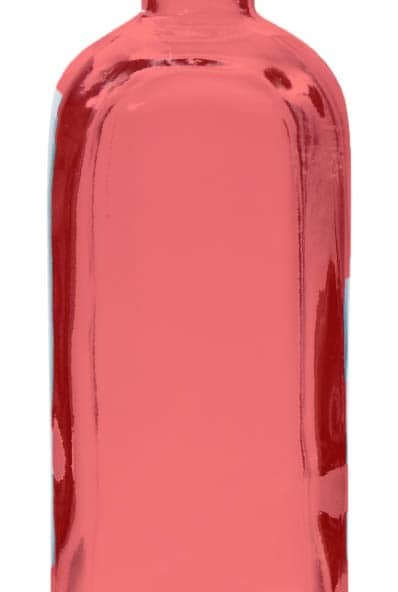 With the Inside Bottle selection active: Edit / Clearso the inside of the bottle is now completely see-thru and transparent. 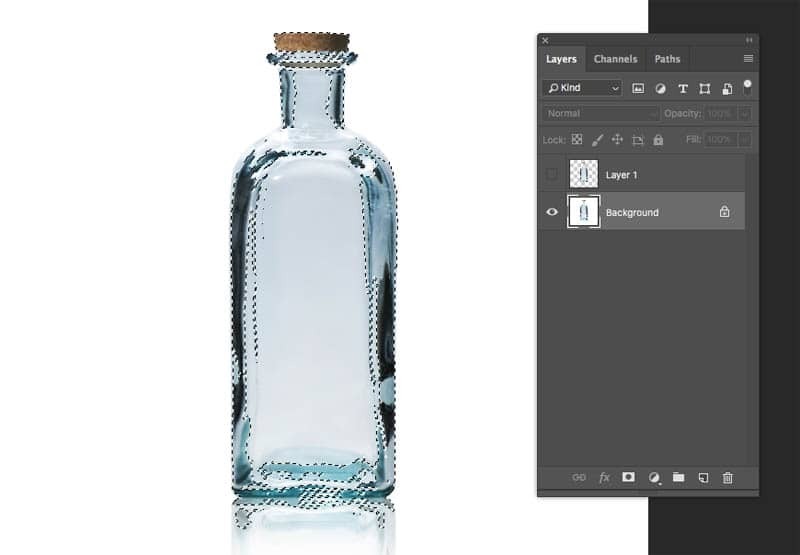 If you want to lower the opacity of the inside of the bottle so it is a little bit cloudy instead of crystal clear, I’m sure there are more sophisticated ways, but you could try this which seems ‘dirt simple’ to me. 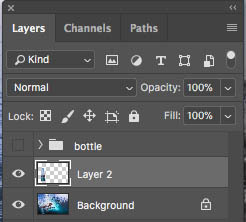 Add a new empty layer above it and name it the ‘Inside Bottle’ layer. 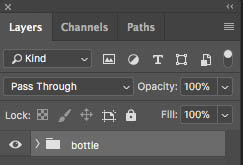 Load the ‘Inside Bottle’ selection that you saved above. 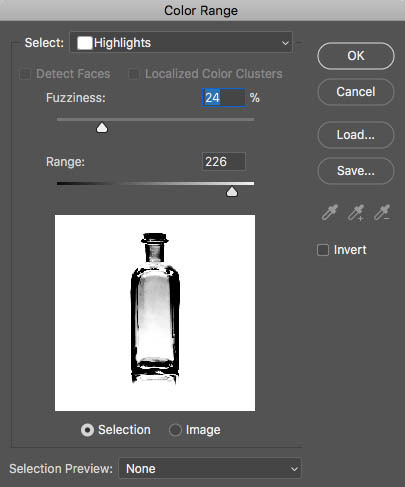 With the Inside Bottle selection still active: Edit / Fillwith “White”. 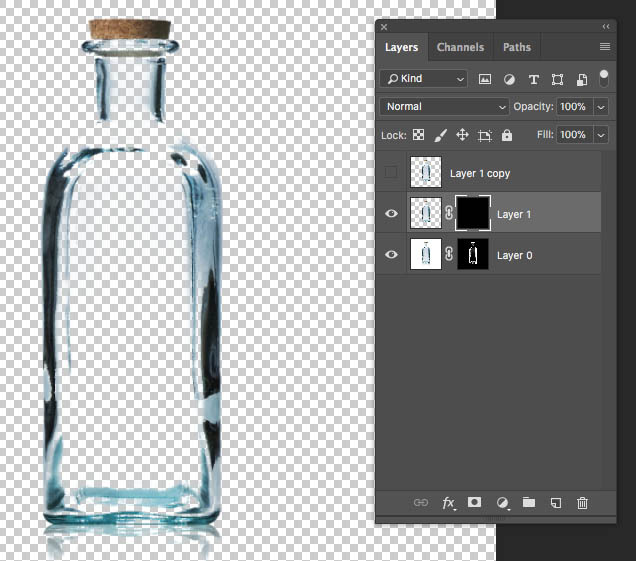 Lower the opacity of the Inside Bottle layer to perhaps 50pct or whatever looks good to you. This is awesome! I can’t wait to try it! Excellent tutorial. I love the written material & pics under the video. Really handy for checking while I’m learning. 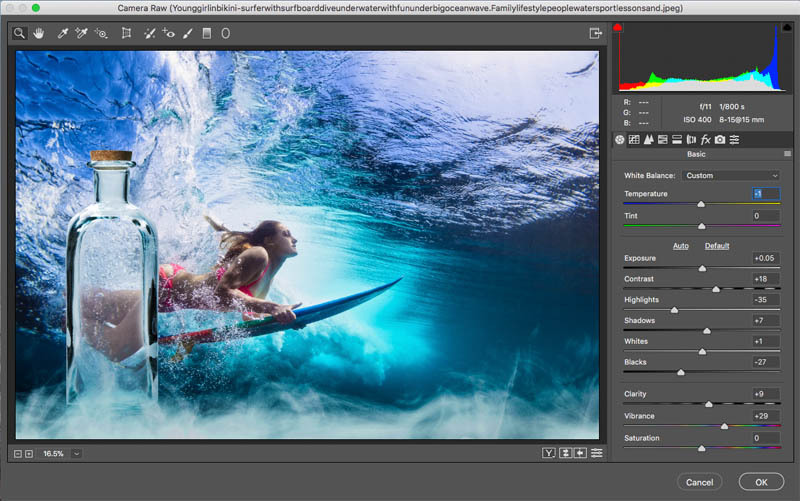 Great stuff, so much easier to follow with written tut & images. (With YouTube trying to follow a vid & needing to constantly switch between instructions & working in PS is no fun). Colin, you did it again. This is indeed a very classy series of effects which can be used in many real world instances. It is simple, effective and a great deal of fun!! !